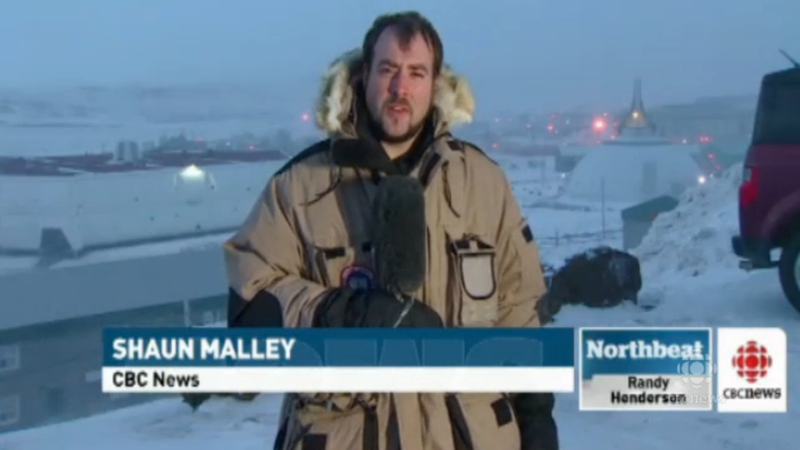 “If you think Iqaluit is the North, you have another thing coming.” So some folks in this Canadian city of 6,699 people have said to Shaun Malley, a video journalist for CBC North who moved from Montreal to Iqaluit, Nunavut in January 2014. Malley has been working as a reporter since 2011 and full-time at CBC (the Canadian Broadcasting Corporation) for a little over two years, which for him is a “dream come true.” Though Malley is a newcomer to the Arctic, he’s reporting on it from the inside. Especially when it comes to northern issues, this makes him a relative rarity given the current media world in which people (including your blogger) report on issues happening thousands of miles away from their places of residence. By living and working in Iqaluit, Malley has managed to make it – North or not – his new home. In all of Nunavut and Nunavik, CBC North has approximately 30 employees. The channel’s office in Iqaluit, where Malley works, has three full-time reporters, along with a fourth who is about to become a video journalist. CBC North also runs stations in Rankin Inlet and Kuujjuaq, Nunavik (northern Quebec). 30-minute Inuktitut and 60-minute English-language television news programs are produced daily (thanks to CBC North Area Manager Patrick Nagle for the clarification). The program in Inuktitut, the main Inuit language spoken in Eastern Canada, allows many of Canada’s indigenous people to hear news and features in their own language. CBC North geographic reach extends beyond northeastern Canada, however, for their TV programs air from Yukon in the west to Labrador in the East. As Malley noted, “It’s a huge landmass, and a people from coast to coast to coast kind of thing,” referencing the fact that Canada borders the Pacific, Atlantic, and Arctic Oceans. Television is only half the story, though, as CBC North produces a total of 60 hours of radio programming each week in Inuktitut and English. Malley does some radio work for the Eastern Arctic CBC Radio 1 Network, which broadcasts throughout Nunavut, Nunavik, and a small part of Labrador, where Inuttitut, a dialect related to Inuktiktut, is spoken. I spoke to Malley about his first impressions of the capital of Nunavut and how long he intends to stay, given the itinerant nature of many workers in the Arctic who come up from its southern fringes. We also talked about the bigger picture – how the focus on sovereignty displaces attention from issues closer to home for people in the North, such as food security, how the media tells stories about the Arctic both to its residents and those outside the region, and how living in the Arctic has affected his identity as a Canadian. MB: How long have you been working in Iqaluit? SM: Not super long. I got here January 15 after a quick week of training in Winnipeg. So it’s been kind of the weirdest five months of my life, but also the most amazing, as it’s really the most lovely place. I get to do work that I never would have gotten to do had I continued to stay in Montreal. I love Montreal, and it’s still in some ways the center of my universe as almost all my family and friends are there. But I also felt that I’d always had this longing to go somewhere further afield and try something different. If I hadn’t taken that opportunity, I would have regretted it. MB: Is your job an indefinite posting? SM: Yes, it’s an indefinite thing. I have permanent status, which is pretty rare. I could be here for the rest of my life, though I can’t really say for sure. The minute I got off the plane, I felt very comfortable. If I hadn’t had that feeling stepping off plane, I would have tried to get out of it, maybe. But I got off and my boss was there to meet me. The town looked pretty and I got to my apartment, which overlooks the city from the eastern side. It’s one of the most breathtaking views, and I get to wake up to that every day. It’s really easy to love this place. Obviously, it’s got its ups and downs like everything in life and I still miss my family, but being here feels right. MB: Can you comment on the effect of fly-in, fly-out workers on Iqaluit? SM: There’s definitely lots of the fly-in, fly-out in every sector of society. Plenty of people would benefit from coming up here, but it’s also a community. As much as Iqaluit has a booming population, it’s a permanent settlement. It’s home for people – not a stepping stone. It’s where they live their lives. Iqaluit is a vibrant community that’s growing by leaps and bounds and there’s always some new fun activity going on. Even for people who are transient, this is a perfect opportunity to learn about another way of life. As you learn about another culture, you learn more about yourself and your own culture – even for someone who’s not been here for very long. MB: Has your identity as a Canadian changed since moving to Iqaluit? SM: It’s brought home an awareness of the vastness of Canada. I was always vaguely aware of it, as I’ve traveled to all the provinces. Right now, the only jurisdictions I haven’t visited are the Northwest Territories and Yukon. So I’ve always had an appreciation for the size of the country, but not so much the scope. I also never experienced an Arctic winter before. Also, the cultural diversity is something I knew about – I’m from Montreal, and from a bilingual family anyways. But this is a new branch of it to me, and the people are really awesome in terms of sharing Inuit culture. It’s something that I feel should be a Canadian value. And here, not to say it isn’t elsewhere, but it’s a matter of sharing the different lifestyles and different foods we consume up here – so it’s had an effect on how I view this country. MB: How about your perception of the Arctic – has that changed? SM: Yeah, it has. I had had notions of what the North was like, and to be honest, there are people who have told me, “If you think Iqaluit is the North, you have another thing coming.” Because Iqaluit is so tied to Ottawa with daily flights, food prices are not so bad. If you get further afield to Grise Fjord or Gjoa Haven, the prices for food just skyrocket. You can’t get fresh sushi or Italian soda on a weekly basis, whereas here, I can just go next door to the coffee shop and easily pick up sushi or soda. It’s obviously a vast territory and every community is different, so I can only really tell you my perspective as an outsider in Iqaluit. So before, I knew a little bit. But other than the regular run of the mill things like, “It’s bloody cold,” and, “There are some people,” and, “There is resource extraction picking up,” I didn’t know the ins and outs. I had an awareness of the Arctic sovereignty issue and how that was becoming an issue between the U.S. and Canada, and obviously the U.S. and Russia, and Canada and Russia, but learning that those territorial issues were still alive in 2014 long after the battles of 1812 are over was still interesting on a geopolitical level. MB: Do you think sovereignty is as important an issue to people in the North as Prime Minister Stephen Harper makes it out to be? SM: It really depends on who you talk to. I’ll be honest: I’m a little tainted because I’ve been working on a story about food security, which I think in a lot of people’s minds would trump national security. It’s not that they’re not concerned about national security, but since 70% of households face some form of food insecurity, like malnutrition, that to me seems the real issue rather than Russian incursions into the Northwest Passage. For most people, I think that is an issue, but there are things that are quite literally closer to home. MB: What kinds of stories do you cover in Iqaluit? SM: Having come from Montreal, which has all the typical big city problems, the Iqaluit newsroom is kind of a 180. There are a lot of things going on that are newsworthy, but the rhythm is different. One week I did a story about a spring festival and a story about mining, so it goes from the “soft”-type news stories to the “hard” type news stories. I enjoy both, and if I had just one set beat, it would be less interesting. I’m interested in anything that will make a good story. The key is a compelling person that forms the thread of what you’re talking about. I feel it’s my job to find these compelling voices and weave a narrative around what they say. If I can finally find a way to do that properly, I’ll be very happy myself no matter what the subject matter is. MB: Are there any narratives that you think the media overplays when reporting on the Arctic? SM: It’s interesting because there is a dichotomy between the way we report news locally and when we file for national platforms. We are a regional news organization but because we are CBC, we occasionally provide content for the national network. So when we speak locally, the focus is really on local issues, but when we report for the national network, we wouldn’t write the way we do for a regional newscast. One thing that my boss has reminded me is that there are a lot of clichés that people from the South come up with and bring to the North, such as the “vast Arctic wasteland.” That’s a big no-no because first of all, it’s not true, and second of all, it’s home for a lot of people. Nunavut has around 30,000 people – so it is home, and it’s also teeming with wildlife. That’s one thing to keep in mind as a reporter especially when speaking locally. Maybe it’s even more important nationally, though. It’s incumbent on us reporters in the North when speaking to a southern Canadian audience that there are communities and life here. It’s not one big, slowly – actually rapidly – melting ice cap north of the country. It’s a series of vibrant communities. One of the country’s fastest-growing sections of the population is in Nunavut. One of my duties for our local audience is to report the news in a way that isn’t condescending. Even though I’m an outsider, it’s my job to be an effective communicator and give people the stories they need to help go about their daily lives with as little of my southern preconceptions as possible. You can also follow his adventures in the Canadian Arctic @shaunmalley. Just a note on this story. CBC North has about 30 employees in Nunavut and Nunavik, including reporters, producers, videographers, program hosts and technical staff, producing more than 60 hours of radio programming every week in Inuktitut and English, and contributing to a daily 30 minute Inuktitut and 60 minute English television news programs. Thanks for the clarification, Patrick. Sorry for my mistake. I’ll update the post accordingly.